Shares of Facebook and Groupon fell to new record lows Tuesday as investors continue punish the one-time technology darlings. Facebook was down 1.7% in mid-afternoon trading and at one point hit $17.55, marking a new low since the stock's ill-fated debut in May. 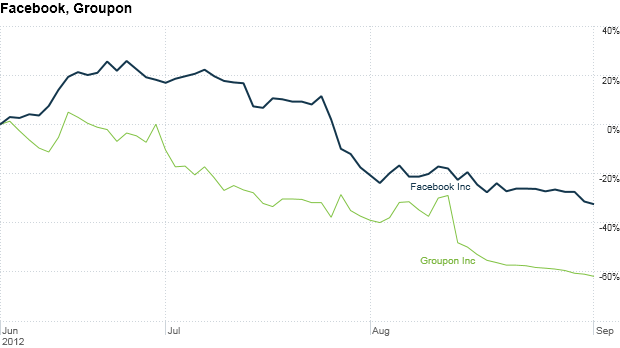 Groupon fell 2.3% to $4.05 per share, extending this year's slide to nearly 80%. It's been tough sledding for Facebook since it first offered shares to the public for $38 a piece. The biggest challenge now facing the social network, analysts say, is the multiple expiration of lock-up periods, which is when company insiders and major stakeholders can sell their shares. Traders on StockTwits were unwilling to cut Facebook any slack. menax73: $FB is this symbol for "Fail to Bounce" LOL. harandian: $FB when was the last time a copmany lost 50 billion market cap in a rising market and the CEO didnt bother to come out & defend his company. Meanwhile, investors aren't taking any chances on Groupon, which reported sluggish revenue growth in the second quarter, even as earnings rose more than expected. investorsmosaic: $GRPN beginning to price in bankruptcy as cash flow will go massively negative as growth stalls.